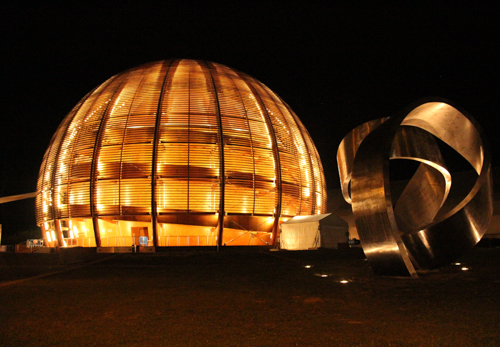 Our next outing took us to Geneva, the home of CERN, a scientific community that primarily studies particle physics. 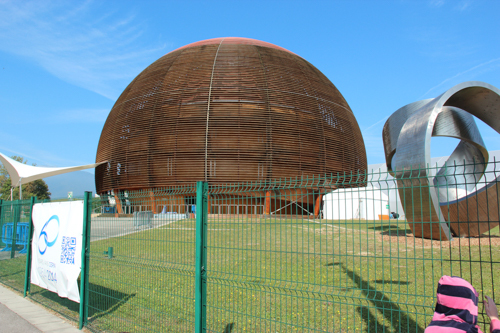 CERN was the birthplace of the worldwide web in 1989 and today marks the 60th anniversary of its formation. Because of the cooperative nature of their ventures, the fact that CERN comprises 21 member states, and that they’re doing really cool stuff — when I was describing CERN to the girls, I called it a Rainbow Gathering of scientists. They understand that; scientists of different nationalities get together to work and play and encourage each other in their fields of passion. 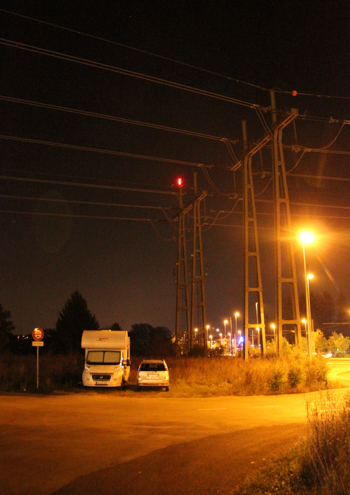 We arrived at CERN last night, and I parked as close as I could — which happened to be under the humming power lines that feed the world's largest and most powerful particle accelerator. Each year, CERN consumes the same amount of electricity as 300,000 homes. No wonder I had funky dreams! When lit up at night, the Globe of Science and Innovation is a beautiful beacon of scientific cooperation. The Canadian artist Gayle Hermick's "Wandering the Immeasurable" sits alongside the globe. In the morning, we discover that the globe is closed this week for special events happening around the anniversary. 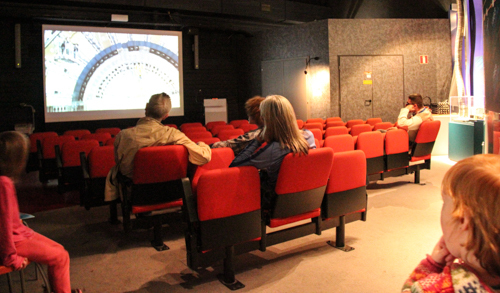 Usually the globe is open for public access to a permanent exhibition called "Universe of particles". I had particularly timed our visit to CERN to coincide with its 60th anniversary celebrations, but it appears that the special events are for invited guests only. Despite our disappointment, we cross the road to the main reception area to see if the other exhibitions are still open. 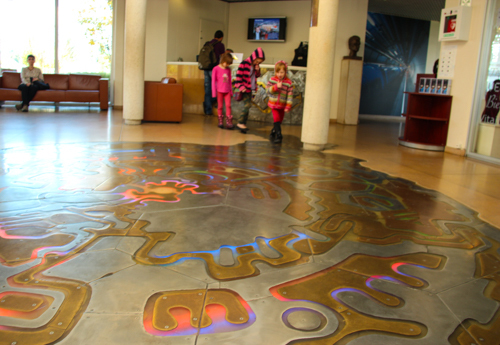 In a beautiful fusion of science and art, the light in this in-floor sculpture by Frenchman Serge Moro changes colour, intensity and location in response to particle showers from cosmic rays that reach the earth. A physicist waiting in the lobby watched the girls interacting with the floor and explained the details of how it worked to us. To see more details of Serge Moro’s work, visit his website. Similar installations are in place in Russia and London. The Microcosm exhibition is scheduled for major refurbishment in the first half of 2015, so we’re visiting it when it feels tired and out-dated. Nevertheless, the girls are happy to run down the stairs and enter the surprisingly in-depth explanations of particle physics, how the Large Hadron Collider works and the history of computers and the worldwide web. 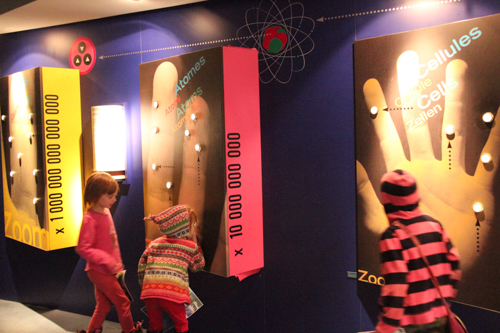 The exhibition starts at a basic level of physics and progressively gets more complicated. 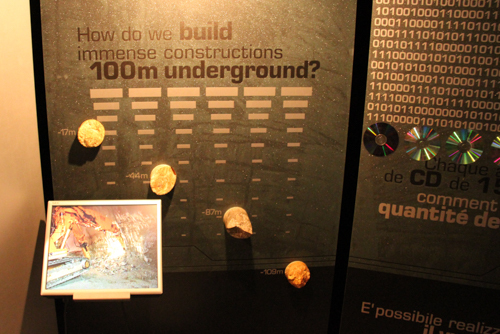 It's geared towards school-kids, and each display is explained in four languages: English, French, German and Italian. 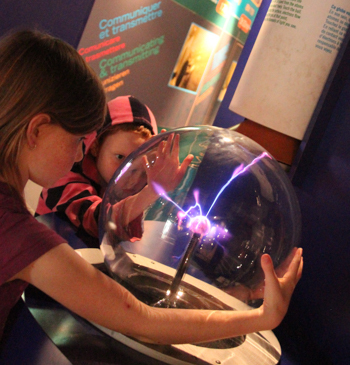 Using a plasma ball, children can obviously see how particles can be affected by forces. A plasma ball uses electrons that are stripped from the atoms and move about freely. When the ball is touched, the surface is earthed and electrons flow through the gas, creating the threads of light. Even though the technology for the interactions is outdated, the girls don't seem to mind and play with everything they can, learning heaps in the process. 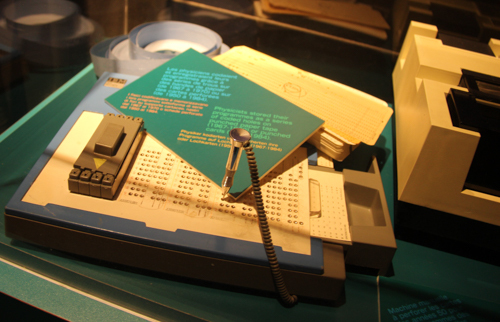 I like seeing the exhibits of vintage computers, like this card-punching one. CERN is also the site of the largest and most powerful particle accelerator, the Large Hadron Collider whose acronym (LHC) is as famous within scientific circles as “www”. Inside the super-chilled vacuum of the accelerator, two high-energy particle beams travel at almost the speed of light before they are forced to collide. Among other things, CERN scientists observing the effects hope to learn more about the nature of dark matter, the existence of other dimensions as proposed by string theory and the relationship between quantum mechanics and general relativity. 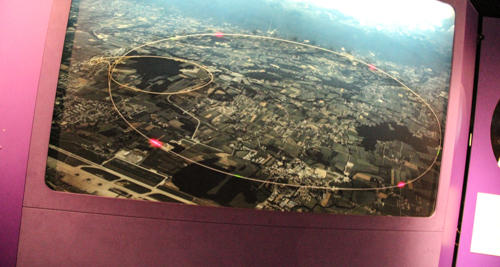 An aerial-view photo displays the size and location of the Large Hadron Collider which is actually located 100 metres below the surface. 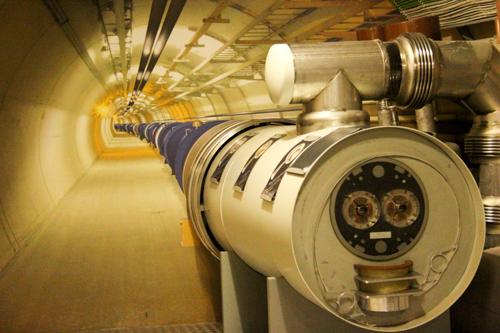 This is what the inside of the LHC tunnel looks like. It's a 27-kilometre ring of superconducting magnets with a number of accelerating structures to boost the energy of the particles along the way. Scientists use bicycles to navigate around the ring. A video presentation explaining the LHC is very well-done. We watch it twice, with the girls fully paying attention both times. Although the displays may be technologically outdated, the information isn’t. 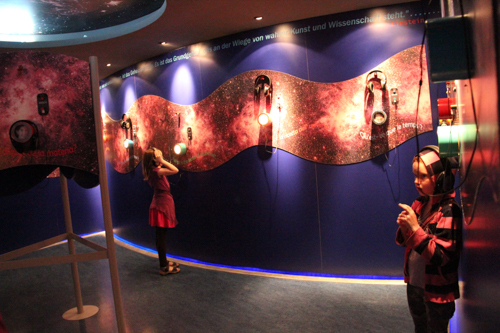 It takes us about an hour to move through the exhibition, and this would be a great place to re-visit when the children get older and can understand more of the concepts they’re hearing.